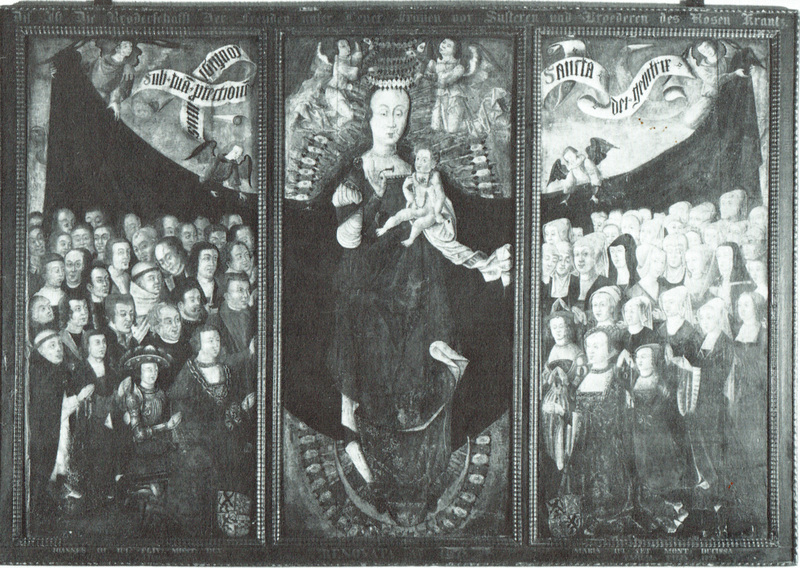 Triptychon der Rosenkranzbruderschaft, 1524, in der Stiftskirche St. Lambertus in Düsseldorf, restored in 1678. Very large image available here. There are very few available images of this painting. While it has been restored over a century later the depictions of dress in this painting compare favourably with other depictions of women in this region and time. A closer look at the right hand side show Maria at bottom left, her daughters Anna to our left and Amalia to our right. Maria is dressed in a rich gold and red fabric. While the pattern is not discernable in either of these two images it is clearly rich and a fairly even balance between gold and probably crimson velvet in the weave. Anna appears to be dressed in yellow, Amalia in a rich pink/coral. It is decidedly lighter than the crimson in her mother’s dress and even the robes of lady in waiting to the far right. It appears to be lighter than the red of the dress accessories of the ladies in waiting further back.